Looking for a way to create a WordPress order form? To create an order form on WordPress, you’ll need an eCommerce plugin to manage products and process payments, plus a separate plugin to help you create a frontend order form for your visitors to interact with. You can pick your preferred plugin from the list, and you’ll also have tons of options to customize how your WordPress order form looks and functions. I’ll also tell you how to create a WordPress order form with any other eCommerce plugin. Before we get to the full WordPress order form tutorial, let’s go more in-depth into what you’ll need to follow along. If you want to create a WordPress order form, you naturally need a way to accept and process payments. However, WordPress doesn’t include this functionality by default. To add payment functionality to WordPress, you can use one of the many free eCommerce WordPress plugins. Yes – you can use these plugins even if you aren’t planning to create a “traditional” eCommerce store. However, these eCommerce plugins are still focused on creating that traditional eCommerce look (where you have a catalog and individual product pages). So to create the front-end of your one-page WordPress order form, you’ll use either the WooCommerce Product Table plugin (if you’re using the WooCommerce eCommerce plugin) or the Posts Table Pro plugin (if you’re using another eCommerce plugin). Your chosen eCommerce plugin will handle processing payments and managing whatever “products” you’re selling via your order form. WooCommerce Product Table or Posts Table Pro will help you take those “products” and display them in a customizable order form for shoppers to use. For this tutorial, we’re going to assume that you’ve already created a store with your chosen eCommerce plugin. That is, if you want to create a WordPress order form with WooCommerce, you’ve already installed WooCommerce and added some products. Similarly, if you want to use Easy Digital Downloads, you’ve already installed it and added some products. WooCommerce is the most popular WordPress eCommerce plugin by a large margin. As such, it makes for a great option to power your order form. If you’re interested in a more in-depth look at this application, we have an entire post on how to create a WooCommerce order form, as well as a printable order form. To create a WordPress order form with WooCommerce, you’ll need the dedicated WooCommerce Product Table plugin. The easy way to create a one-page WordPress order form with WooCommerce. Feel free to configure any of the plugin’s other settings as well. For example, you can add product filters or a search box if you have a lengthy order form. If you just want to display specific products in the order form, then you can use the instructions on this page. For example, this is a good way to create a separate order form for each product category. If you’re selling a choice of options for each product then you can add them as variable products. 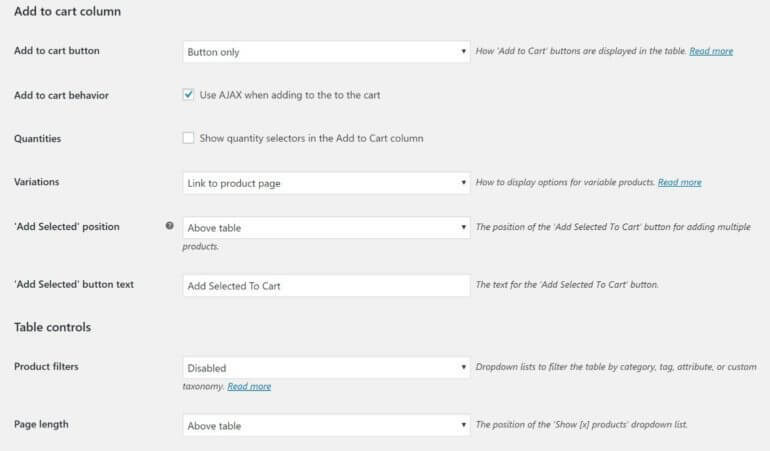 The product variations will then appear as dropdowns in the add to cart column of the WordPress WooCommerce order form. To create an Easy Digital Downloads order form, you’ll use the Posts Table Pro plugin. List Easy Digital Downloads products in a quick one0-page EDD order form. Once you’ve installed and activated the plugin, go to Settings → Posts Table Pro to configure the plugin’s settings. Then, you can use the Columns options to control what product information to display. Learn more about columns. title – the product title. To add a “Buy Now” button, you can use the free Advanced Custom Fields plugin to add a new field to the Download post type. Then, you’ll need to add the download’s Purchase Shortcode to the custom field. You can then add that custom field as its own column in the order form and have Posts Table Pro process the shortcode to display the buy now button. If you need more detailed instructions, check out our full Easy Digital Downloads order form tutorial. This includes extra information, such as how to add product filters and how to display specific products only. Once you’ve finished configuring the Posts Table Pro settings, you can display your Easy Digital Downloads order form by using the [posts_table] shortcode. 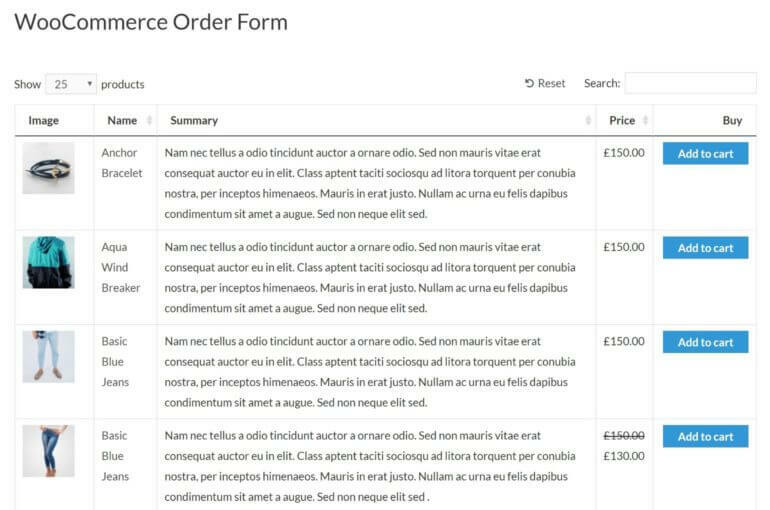 To create a WP eCommerce order form, you’ll also use the Posts Table Pro plugin. The best way to sell online with WordPress and a WP eCommerce order form. Once you’ve installed and activated it, head to Settings → Posts Table Pro to configure the plugin’s settings. Then, you can use the Columns options to configure what product information to display. Learn more about columns. Unfortunately, there’s no easy way to add a Buy Now button for WP eCommerce products. Instead, shoppers will be able to click on the product name to go to the individual product page. Once you’ve finished configuring the Posts Table Pro settings, you can display your WP eCommerce order form by using the [posts_table] shortcode. Unlike the other eCommerce platforms covered in this tutorial, BigCommerce isn’t a WordPress plugin. Instead, it’s a hosted eCommerce platform where you create an account on BigCommerce itself, and add your products that way. However, BigCommerce have just released a free WordPress plugin. This acts as a bridge between BigCommerce and WordPress, allowing your BigCommerce plugins to appear in a store layout on any WordPress site. The default store layout isn’t really suitable as a one-page order form. However, you can easily list BigCommerce products in a quick order form with the Posts Table Pro plugin. The quick way to create a BigCommerce order form in WordPress. First, head over to BigCommerce, create an account and add some products. Next, add the Posts Table Pro and BigCommerce for WordPress plugins to your WordPress website. Go to the Posts Table Pro settings page at Settings -> Posts Table Pro. Enter your license key and choose bigcommerce_product from the ‘Post Type’ dropdown. 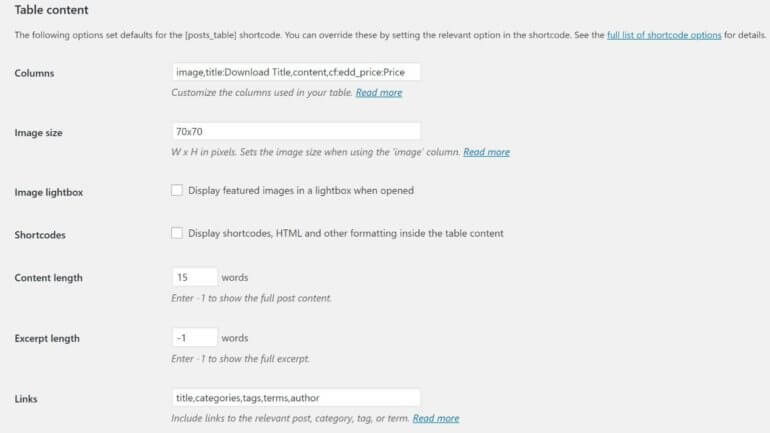 Finally add the shortcode [posts_table] to any page on your WordPress site to create the order form. 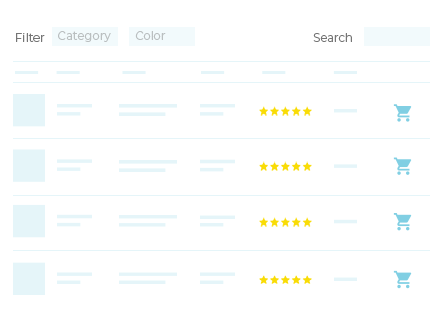 Customers can view your inventory in a BigCommerce product table and click on a product name to see prices and purchase from the single product page. [posts_table term="bigcommerce_category:123456"] – List products from a specific category. [posts_table term="bigcommerce_brand:123456"] – List products with a specific brand. You can also add categories and brand filter dropdowns above the BigCommerce order form. To do this, add tax:bigcommerce_category,tax:bigcommerce_brand to the ‘Filters’ option on the Posts Table Pro plugin settings page. The name of the ‘Products’ post type created by the plugin – you can easily find this by reading through the ‘Post Type’ dropdown on the Posts Table Pro plugin settings page. The name of the fields used by the eCommerce plugin to store information about the products. You’ll use this information to create the columns in your WordPress order form table. Most of the product data will use the standard fields that come with WordPress itself, such as the title and content columns. You can read about these in the Posts Table Pro knowledge base article about choosing your columns. The eCommerce plugin will also create some custom fields of its own, to store extra information such as the price. You’ll need to send the eCommerce plugin company a support request to ask for the name of these custom fields. 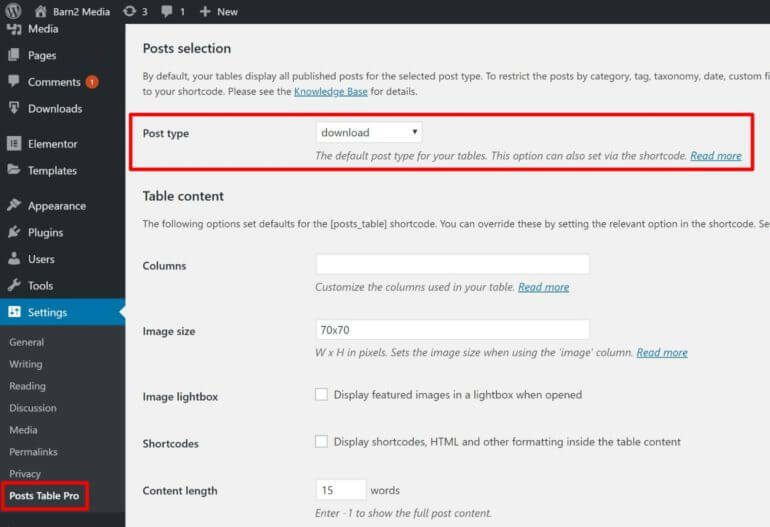 You can then display them in your WordPress order form using Posts Table Pro. To recap, you need two plugins to create a fully-functioning WordPress order form. First, you need an eCommerce plugin that can handle managing products and processing payments. One popular option is WooCommerce, but you can also use other WordPress eCommerce plugins like Easy Digital Downloads or WP eCommerce. From there, you need a tool to create a frontend order form from your products. 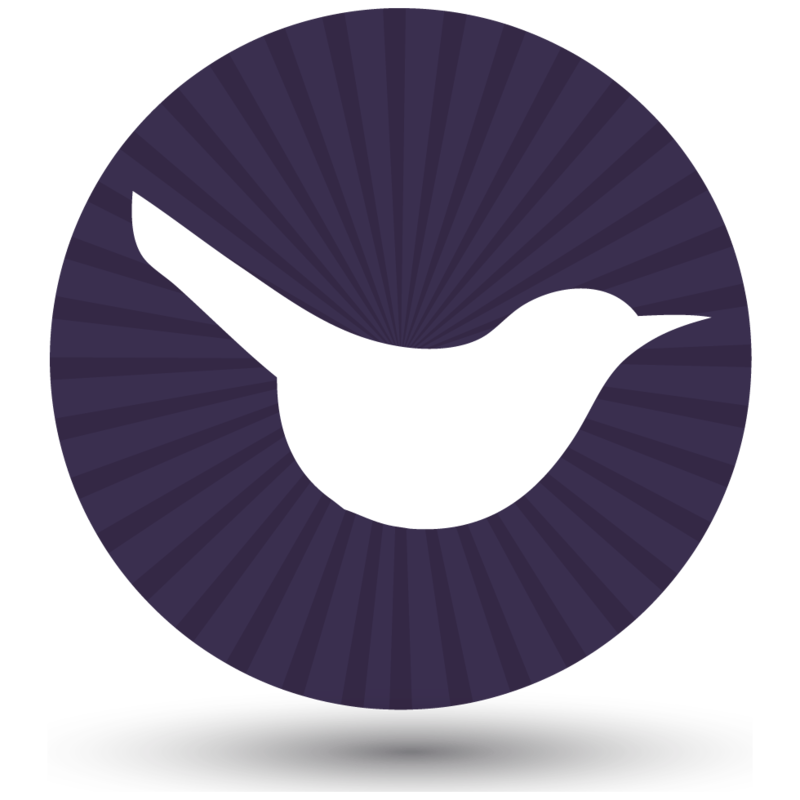 If you’re using WooCommerce, you can use the dedicated WooCommerce Product Table plugin. Or, for any other eCommerce plugin, you can use the Posts Table Pro plugin. Get started today and create a customizable WordPress order form for shoppers at your site. And if you have any questions, leave a comment and we’ll try to point you in the right direction!